Though my mixed media art mostly involves paint on a canvas in some way I have started exploring the world of mixed media jewelry, especially with the use of Ice Resin. I have fallen in love! I have so many new creations to share with you. However I decided for this to be the first one. One of my favorite things is to recycle found objects and to give new life to things that otherwise would end up in the trash. So naturally the clearance section in most stores appeals to me, as if it calls my name the minute I walk through the front door. There they sit, with the bright yellow or red stickers marking down their value because they’re broken or simply sat on the shelf too long. I personally think these things can become even more beautiful, they just need a little TLC, almost like that last scraggly mut waiting to get adopted. So this project started off in front of the Clearance Wall at Hobby Lobby. 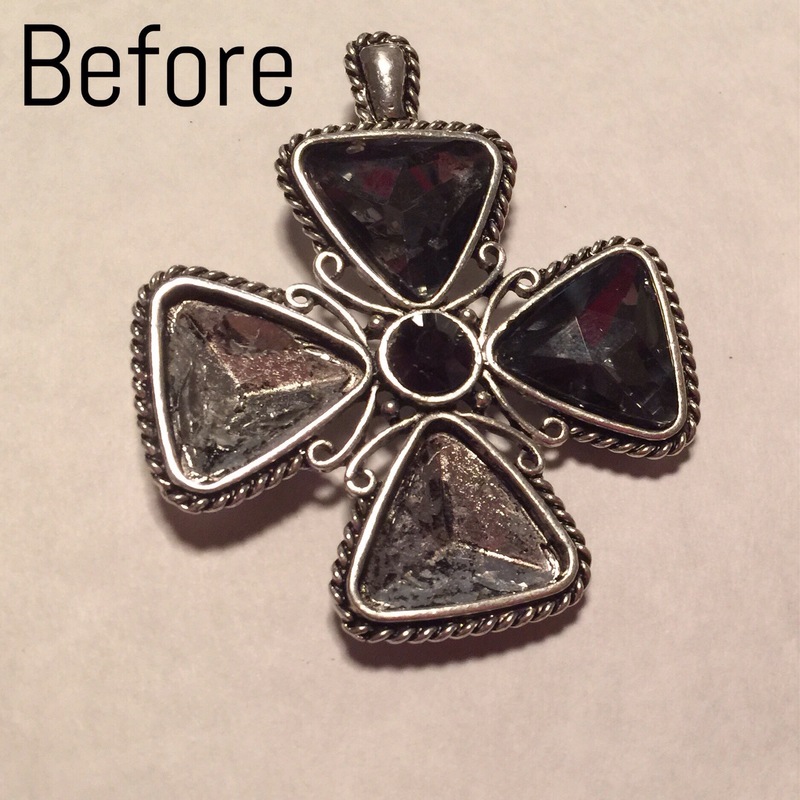 I found this sparkling silver pendant that originally had rhinestones in it but a couple of them were missing. So for only $ .75 (yes 75 cents) I knew I needed to give it a new purpose. I paid its adoption fee and set it free from its clearance tag. 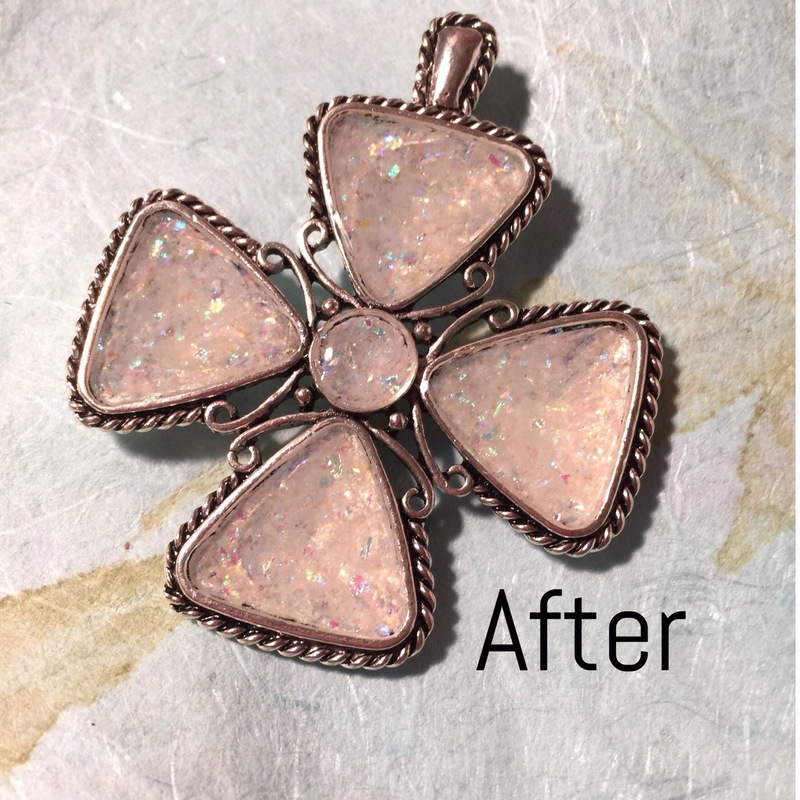 I found that heating the metal pendant with my heat tool made it very easy to pop out the remaining rhinestones with the help of a very small flat head screwdriver and a simple tap with the hammer. Freedom! I now had a great bezel for my Ice Resin. I mixed some Opal Shattered Inclusions into my resin and poured into the bezel. Voila! A fab new pendant to add to a necklace. It started with a great scavenger hunt at garage and estate sales. I scored big time that day with finding several small vintage bottles, lace doilies and other assorted items. 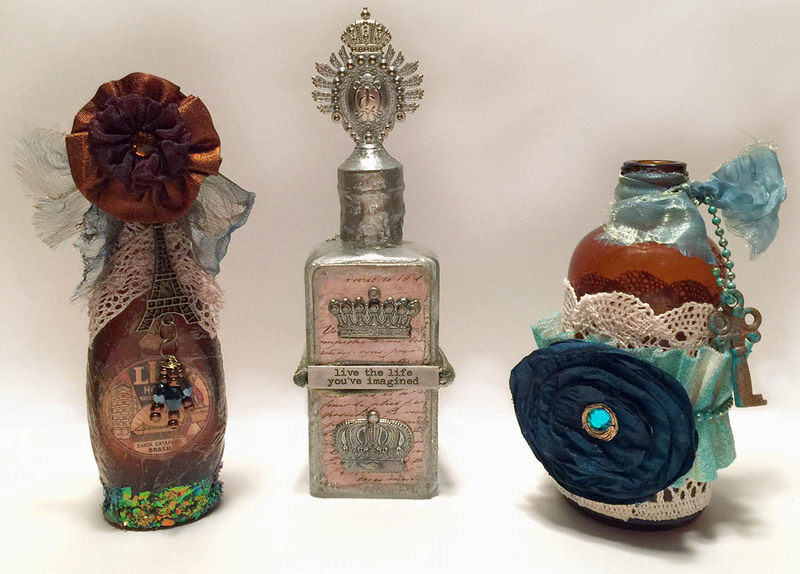 At the time I had no idea what I was going to create but knew I had to have those bottles. After coming across some different images online of altered bottles, mostly recycled wine bottles, I had that perfect Ah ha! moment. The rest, as they say, is history. With various adornments and products like Tim Holz word bands and Susan Lenart Kazmer’s Shattered Fire Opal inclusions and other ribbons, accessories, beads from vintage jewelry, etc. these little beauties were born. Tada! Oh I have so many things to share since I have been pretty busy this summer, I will get to those shortly. In the mean time I want to keep it Simple this Saturday and share something I just did with my daughter. 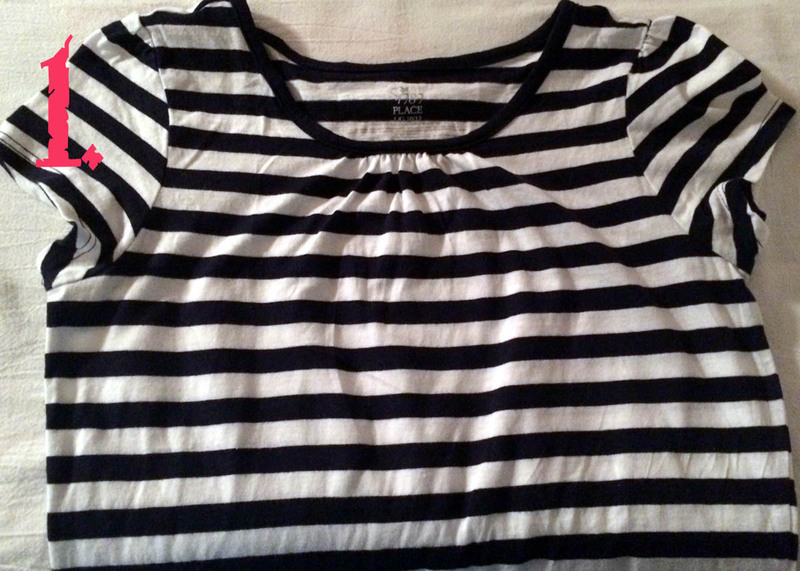 The sailor/nautical theme is pretty popular right now so when I saw this basic navy blue and white striped t-shirt I knew exactly what to do – Iron On! The price for the t-shirt was so great that buying an iron-on decoration was no big deal. Off to Hobby Lobby with our 40% off coupon. 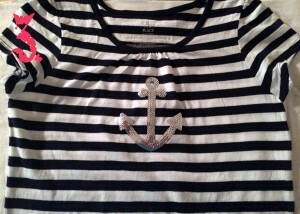 We found 2 different styles of an anchor iron-on to choose from. She chose the sparkly silver sequin anchor. Easy as 1-2-3! 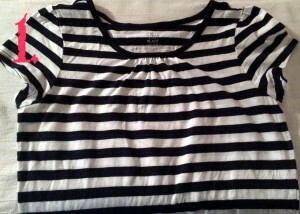 First we ironed the t-shirt to smooth out any wrinkles. Then we found the center by folding the shirt in half matching up the arm holes and marked with a straight pen, a safety pin would also work. 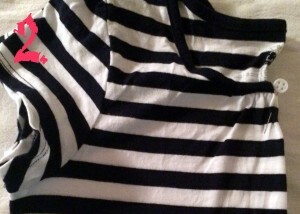 Then we straightened out the shirt and followed the directions on the package for the iron-on patch. Ta-da! And, yes, I say we because I let my daughter help with close supervision. There you have it! 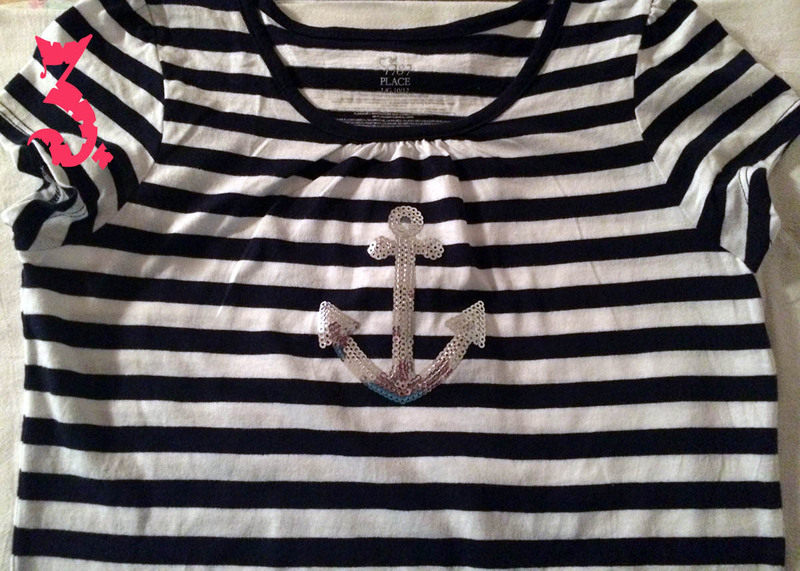 A Sassy Sparkly Sailor Shirt on this Simple Saturday! Try something different – a collage of small patches on a solid color shirt, a comfy pair of jeans or a jean jacket. Oh another Simple Tip! Download the Hobby Lobby or Michaels app on your smart phone and always have a coupon at your fingertips. 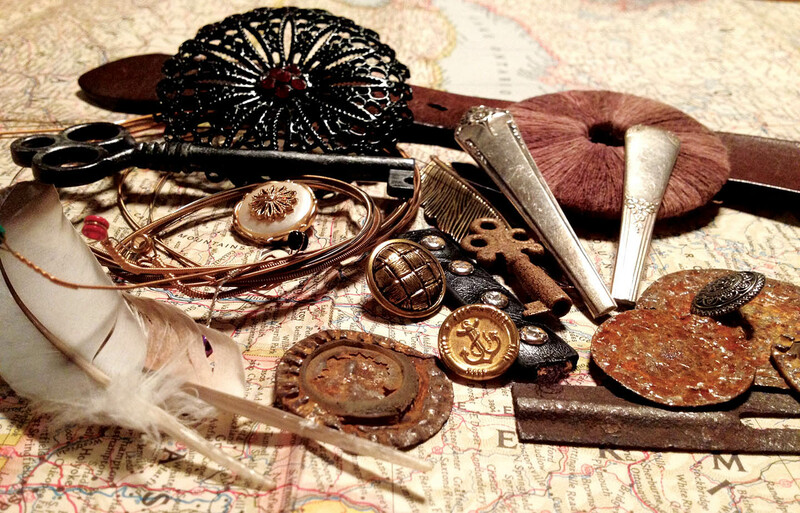 Last week I talked about collecting found objects. There are times when I see things that I can not pick up and take with me though. Textures. I discover beautiful textures all around me and collect them the only way I know how, through the tiny lens on my phone. From intriguing fruit at the grocery store that I’ve never heard of before to an old dilapidated metal post. When I can, I will use these textures in my artwork. 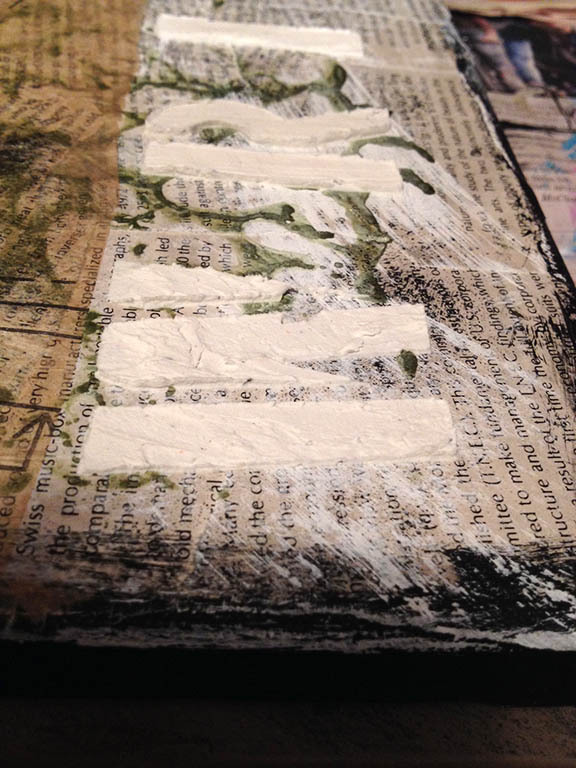 Here is an example where I took a print of one of my texture photos and added it to a mixed media canvas. After stripping the paper backing I had a flexible plastic like piece of material that wrinkled slightly when I adhered it to o the painted canvas adding depth. 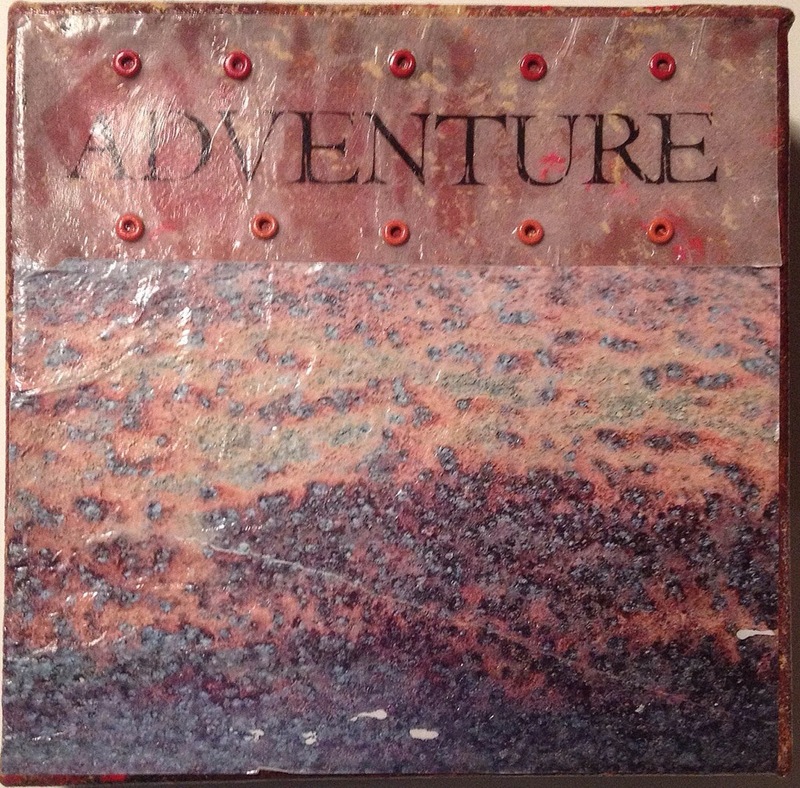 This 6″ x 6″ mixed media canvas is available in my Etsy shop here. I love circles. They inspire me. Perfectly symmetrical circles or less perfect drawn by hand ellipses, all are beautiful, I am not biased. I love many things that are circles from polka dots, which make happy, to clocks that simply make me feel good. I have enjoyed clocks since I was a child. I believe my appreciation came from my grandfather who worked on clocks. The workmanship that went into building a clock intrigued me, all those gears working together in unison was amazing. Last week I shared a part of my collection of found objects. I thought this week I would share one of my pieces involving found objects and my love for circles and clocks. I called it Time Travel. I used 2 very different found objects in this piece, an old disc from my grandmother’s meat grinder and a fan cover off an old cpu that my son and I chopped up for parts. These 2 items are decades apart in age and add to the time travel theme, though they both involve the wonderful circle. The circle. It’s timeless. Never ending. Infinite. Found objects, like a true magpie, I find them everywhere. Though not all sparkly, actually most of them tend to be rusty and worn, yet still they glisten in the light calling my name asking to be picked up. I find them along my way during life. Whether it’s in the parking lot at a local printer that I am visiting for a press check or walking through the parking lot when I’m out grocery shopping. Then there are times that I save things that are worn out or broken so that I can repurpose them, giving them new life. I wanted to share with you part of my collection. A map from 1948 that I found in book that was used in a photo shoot. A couple of nice feathers from a trip to the partk with my kids. Some buttons from my grandmothers old button box. Some guitar strings from my husbands guitar. Some old smashed, rusted bottle caps. Some jewelry that I discovered at a garage sale. An old plastic key from some toy handcuffs that I have already spray painted. Some silver spoons from the antique store down the street. (I already cut off the bowl of the spoons and made necklaces.) I think there may be a few more pieces in there too. I often end up working on more than one project at a time for several different reasons. One being that when I get a chance to work in my studio for any extended amount of time I try to get as much done as possible, this means while I’m waiting for one layer to dry I work on another project. Here are a couple of projects that I am currently working on. This first one is just the beginning stage, the all important book page background layer. This one is special though because rather than just words, it features the most interesting drawings. 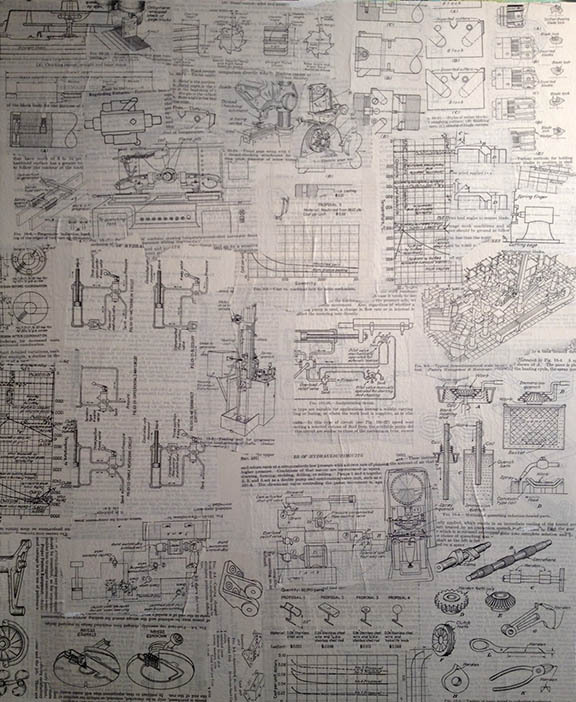 I found this awesome book on one of my garage sale expeditions, a Tool Engineers Handbook from 1949. 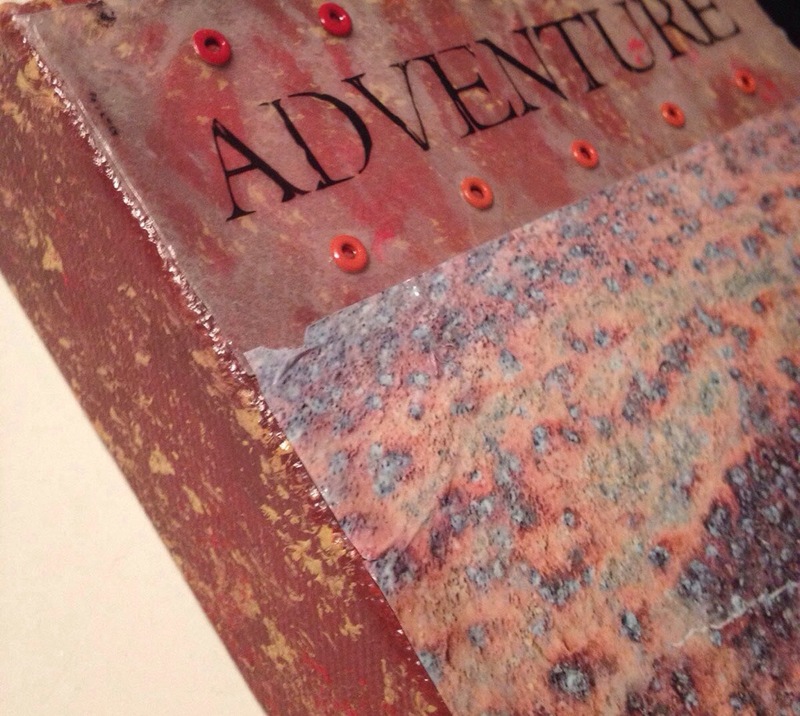 The pages are so thin that when I glued them down you could see the type from the other side of the page show through giving it another visual layer. 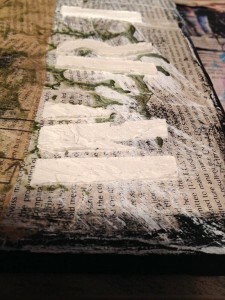 This one shows a close-up of modeling paste used with some letter stencils. I have been watching videos and reading some great things from other artists using modeling paste and decided I wanted to try it. I do believe I am in love with it and will definitely be using it more in my work. I love the dimension that it adds. Hello there, my name is Jessica Salinas and I am a graphic designer by day and a mixed media artist by night and a wife and mother of 2 children in-between. I love graphic design and discovered it about 20 years ago in high school and very quickly made a career of it. 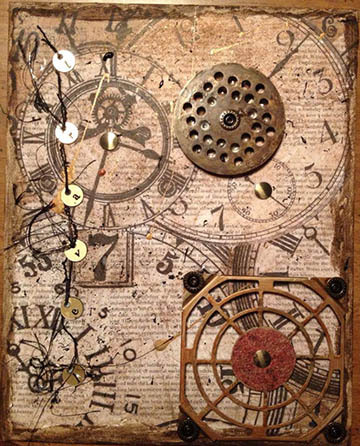 I have a passion for mixed media art using many recycled items that I pick up along my way that otherwise would be common trash. Bright, bold, expressive color on top of rich texture I believe is what my art is all about, especially texture. I love experimenting with all sorts of texture to the point where my paintings become almost like sculptures. Please join me in my creative adventures as I learn and grow in my art. grow taller 4 idiots review forum on Let’s Create!